Recipe writing can be such a buzzkill sometimes. Last week, as I was making this classic skillet meal — Chicken with Spinach and Warm Bacon Vinaigrette — I was, as always, amazed by how fast it came together. While I was whisking in the wine, I was mulling over the angle I wanted to take when I would eventually write it up for DALS. (I make a lot of things that never end up on this site, but there wasn’t even a question about this one.) The angle could be about bacon being the magic ingredient — a little goes a long way, especially with kids. It could be a “quick classic” — who doesn’t love a quick classic? It could be a five-ingredient dinner, i.e. “money in the bank” for working parents. The only problem was — it’s not a five ingredient dinner. But it was so easy and fast that I didn’t even realize that until I started writing the recipe. Suddenly I’m noticing that there was some flour in there for the dredge and that there was not only vinegar, but wine and also — I forgot — there was olive oil after the bacon fat got used up. When I described the recipe to my friend Todd on the train the other day it took about 10 seconds. 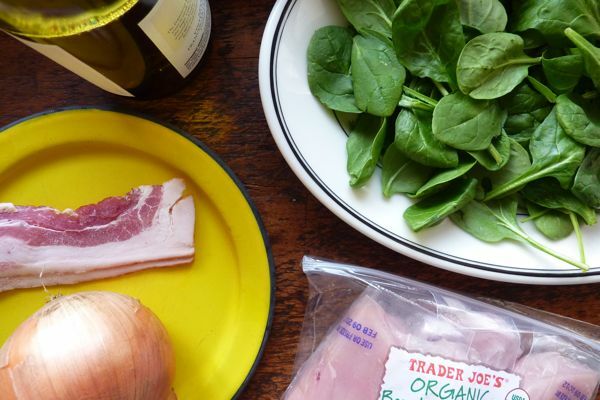 (“Fry some chicken in a little bacon fat, then add shallots, wine and vinegar and toss in spinach until it’s slightly wilted.”) But when I wrote it out below, it suddenly seemed so much more involved. Trust me, though. It’s not. It’s quick and easy and even if there are eight ingredients in it (as opposed to the magic five), it’s likely you have all of them in your pantry or fridge right now. In a large skillet over medium heat, fry bacon until crispy. Remove, cool, and crumble. Turn up heat slightly to medium-high. Dredge chicken breasts in flour, then add to bacon fat, frying on both sides until cooked through. Cook in batches, tenting finished chicken with foil on a separate plate. If necessary, add a little more olive oil to the pan before adding more chicken. Once all chicken has cooked, add a bit more olive oil, then shallots and cook about one minute. Add vinegar and wine, whisking gently until warmed through. Add spinach and toss until it wilts slightly. (You do not want it to shrivel to nothing.) Toss in bacon crumbles. Add warm spinach to four plates along with chicken, drizzling any sauce that remains in pan on top of each. Serve with rice or those cool par-baked Trader Joe’s dinner rolls that my children are officially addicted to. Thanks–I’m trying to make my brief menu for the week, and this is perfect for tonight. I have everything but the chicken, but I knew I was going to have to make a quick grocery run today, anyway. The kids may grudgingly try spinach if it’s bathed in bacon. I was just wandering the aisles of Trader Joe’s this morning trying to plan out my week, while also buying things for my Superbowl party. I came home with ingredients for 3 dinners, but I already have all of this, so it will fit right in on Thursday! Oh but to have a Trader Joes close by…one can only dream. This sounds delicious. I love dinners like these — fast, flavor, bacon fat. Thanks! This is a keeper – delicious and easy. Just made this last night and it turned out great! So simple and quick. I had to use red wine vinegar since that was all we had at home, but I am excited to try it with another type of vinegar next time. Thanks so much! I made this last night and it was great. Fast, easy and my daughter ate the spinach which is a miracle. Thank you once again DALS! My regular rotation is very DALS recipe heavy these days – but that is a good thing. I made it last night too!! Kids gobbled it and best of all I pulled it off in time to make the Little League meeting with ingredients at home. Love your blog. I made it tonight and it was great! My girls did not eat all the spinach, but they ate some, and my husband and I gobbled up anything left on their plates. In fact, my husband said that if he weren’t trying to lose weight for his triathlon in the summer, he would have eaten everything left in the kitchen — high praise indeed! I used the pancetta cubes I found at my TJ’s — so easy! I read your newsletter, do I win the Jane Marvel tote?